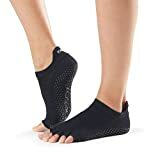 TOESOX: Low rise toe socks hug your foot below the ankle and features ToeSox patented non slip sole for secure footing on any surface. Perfect grip sock for Yoga, Pilates and Barre. Made with super soft, organic cotton in a variety of great colors..
DESIGN: The low rise socks have a low profile design that fits right below the ankle, making this an ideal sock for barefoot exercise activities including barre, pilates, yoga, piyo, kickboxing, and dance. The raised heel tab pads your Achilles tendon.. GRIP: Attain perfect poses with the Low Rise grip sock. The fitted heel eliminates bunching and twisting while the five toe design encourages toes to spread easily. The arch band provides gentle pressure to lift and support your feet during exercise..
MATERIAL: The Low Rise toes socks are designed to keep your feet clean, healthy, and hygienic. Made with 77% Organic Cotton, 19% Polyester, 2% Elastane and 2% Elastodiene, the Low Rise keeps your feet comfortable throughout any work out..
WHY 5 TOES? ToeSox's 5-toe design improves the power of your movements and anchors the sock to your feet, preventing bunching and twisting. The sock will allow you to move and spread your toes naturally, and you'll look fashionable doing so..
Low rise toe socks hug your foot below the ankle and features ToeSox patented non slip sole for secure footing on any surface. Perfect grip sock for Yoga, Pilates and Barre. Made with organic cotton. TOESOX: Ballet inspired Bellarina feels barely there and features ToeSox patented non slip sole for secure footing on any surface. Heel tab protects Achilles at the Barre. Made with super soft, organic cotton in a variety of great colors..
DESIGN: The non-slip Bellarina toe socks have a low profile design that fits right below the ankle, making the perfect sock for barefoot studio activities including barre, pilates, yoga, kickboxing, & dance. The fitted heel eliminates bunching & twisting.. GRIP: Achieve perfect poses in comfort with the Bellarina toe socks. The patented non-slip grip sole provides secure foot placement while the five toe design encourages toes to spread and breathe more easily. The open foot design feels "barely there.". MATERIAL: The Bellarina toe socks makes for a great alternative to keep your feet clean, healthy, and hygienic. Made with 77% Organic Cotton 19% Polyester, and 4% Other Fiber, the Bellarina keeps your feet comfortable throughout any exercise..
< br>ABOUT TOESOX: Our story unfolded over 10 years ago in a yoga class. We saw slipping feet that needed extra grip, clean soles that needed germ protection, and cold toes that needed warmth. ToeSox was born. From a small garage in Los Angeles, we created the original five-toe grip socks to help people during barefoot fitness classes like yoga, Pilates, barre and dance. To this day, our intention is to create products that enhance and support natural movement regardless of the activity. Whether holding plank a little longer, staying grounded in Relevé, settling deeper into Warrior II, or running for miles blister free, we've got you covered.WHY SPREAD 'EM? There's nothing more beautiful than natural movements that make us stronger. Legs that leap, arms that swing, backs that bend. So why not toes that wiggle and spread? It's the way nature designed them to move. A five toe sock design helps spread your five toes - reinforcing what yogis have known for years - that spreading your toes creates a broader foundation on which to balance. We're not only on a mission to spread toes, but love as well. From the quality we put into our products, to the relationships we build with our customers, to the culture we create at the office, to the community we support, to the care we give our bodies - all of these are done with love.Many foot ailments can be genetic, but many are caused from a lack of attention to design. Spreading your five toes is one of the best ways to help your feet.-RELIEVE discomfort and pain from bunions caused from wearing constraining footwear.-HELP reverse the damage caused by wearing tight, ill-fitting shoes that cause painful foot ailments.-ACTIVATE muscles and increase blood circulation for enhanced healing.-ALIGN the bones and strengthen muscles to train the toes to naturally uncross. Spread love to your feet by spreading your five toes with us. TOESOX: ToeSox classic style rests just above the ankle and is a hygienic alternative to bare feet. 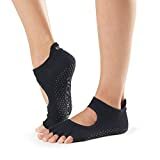 This grip toe sock provides secure foot placement on the floor, mat or equipment for your Yoga, Pilates & Barre class..
DESIGN: The non-slip Ankle socks has a profile design that fits right at the ankle, making this an ideal workout accessory for Pilates, barre, yoga, and dance. The arch support band gently lifts and supports your feet.. GRIP: Achieve perfect poses in comfort with the Ankle grip sock. Fitted heel keeps sock in place to eliminate bunching and twisting while the five toe design encourages toes to spread and breathe more easily. Exercise comfortably with the Ankle sock..
MATERIAL: The Ankle toes socks makes for a great alternative to keep your feet clean, healthy, and hygienic. Made with 77% Organic Cotton, 19% Polyester, and 4% Other Fiber, the Ankle keeps your feet comfortable throughout any exercise.. It's like you're bare foot...but even better. For all barefoot activities, like Pilates, yoga, dance, barre, and martial arts. Stick To Your Practice. Ballet-inspired, bare foot experience for yoga, barre and Pilates..
DESIGN: Five toe construction allows toes to move and spread naturally. Fitted heel eliminates bunching and twisting. Arch band provides gentle pressure to lift and support. Open foot design feels barely there..
HYGIENIC: Barrier between foot and equipment protects feet from unwanted dirt and germs.. CONTENTS: All cotton is sourced certified organic. 90% Organic Cotton 8% Elastane, 2% Other Fiber. Printed socks: 58% Polyester, 32% Cotton, 8% Elastane, 2% Other Fiber. Machine washable. Wash inside out in gentle cycle. Line dry or low heat in dryer. 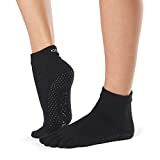 No bleach or iron..
ToeSox Bella grip socks low profile design fits below the ankle and features ToeSox patented non-slip sole for secure footing on any surface. Ballet-inspired, barely there, barefoot experience; perfect for barre, Pilates, yoga, and dance. 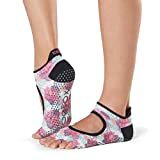 Design: The toeless Bella socks low design fits right below the ankle, making an ideal sock for barefoot exercise activities including barre, piyo, kickboxing, and dance. The fitted heel keeps sock in place to eliminate bunching and twisting. Grip: Achieve perfect poses in comfort with the Bella grip sock. The patented non-slip grip sole provides secure foot placement while the five toe design encourages toes to spread and breathe more easily. The open foot design feels "barely there". Material; The Bella grip sock makes for an excellent alternative to keep your feet clean, healthy, and hygienic. Made with organic cotton material, the Bella sock keeps your feet warm and comfortable throughout any barefoot exercise. Why 5 Toes? ToeSox's 5-toe design improves the power of your movements and anchors the sock to your feet, preventing bunching and twisting. The sock will allow you to move and spread your toes naturally, and you'll look fashionable doing so. Ballet inspired Bella toe socks feel barely there and features ToeSox patented non slip sole for secure footing on any surface. Perfect grip sock for Yoga, Pilates and Barre.ABOUT TOESOX:ToeSox is an innovative brand driven by active lifestyles. We are best known for our patented grip socks created to handle the demanding technical needs of barre, dance, Pilates and yoga. 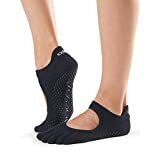 Inspired by function, fashion and foot health, the ToeSox product line includes five toe studio grip, dance, sport and casual socks as well as five toe sandals, leg warmers and grip gloves. Whether holding plank a little longer, being more grounded in Relevé or clocking the miles blister-free, ToeSox has you covered.WHY SPREAD ‘EM?The best part of a pedicure is the foot massage. Those precious moments of pampering and soaking in warm water is our sweet reward for carrying us around all day. At some point, we’ve all experienced foot pain. Whether from long days in closed-toe shoes or a night out dancing in heels, our feet yell at us with our discomfort. Each foot is designed with 26 bones, 33 joints, more than a hundred muscles, tendons, and ligaments--that’s a lot happening in such compact space! Let’s help these poor soles out.While many foot ailments can be genetic, many are caused from a lack of attention to our design. Spreading your five toes is one of the best ways to help your feet.-RELIEVE discomfort and pain from bunions caused from wearing constraining footwear.-HELP reverse the damage caused by wearing tight, ill-fitting shoes that can cause painful foot ailments like Morton’s Neuroma.-ACTIVATE muscles and increase blood circulation for enhanced healing.-ALIGN the bones and strengthen muscles to train the toes to naturally uncross.The foot is designed with five toes for a purpose so our products are created to support this natural movement – with five toes. Bellarina Has Everything You Need In A Barre Sock. Bellarina Struts Her Stuff With A Heel Tab That Provides Extra Comfort And Protection To The Achilles Tendon. She Rocks An Arch Band For Graceful Lift And Support. Wear Bellarina For All Barefoot Activities Like Barre, Pilates, Yoga, And Dance. Stick To Your Practice'.. Grip. Toesox Patented Grip Sock Ensures Non Slip And Provides Secure Foot Placement During All Bare Foot Fitness Practices. Ballet Inspired Bellarina Feels Barely There And Features Toesox Patented Non Slip Sole For Secure Footing On Any Surface. Heel Tab Protects Achilles Throughout All Of Your Studio Fitness Activities. Made With Super Soft, Organic Cotton In A Variety Of Great Colors. Perfect Grip Sock For Ballet, Yoga, Pilates And Barre. About Toesox. Toesox Is An Innovative Brand Driven By Active Lifestyles. We Are Best Known For Our Patented Grip Socks Created To Handle The Demanding Technical Needs Of Barre, Dance, Pilates And Yoga. 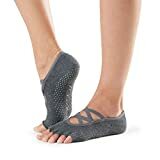 Inspired By Function, Fashion And Foot Health, The Toesox Product Line Includes Five Toe Studio Grip, Dance, Sport And Casual Socks As Well As Five Toe Sandals, Leg Warmers And Grip Gloves. Whether Holding Plank A Little Longer, Being More Grounded In Relev Or Clocking The Miles Blister-Free, Toesox Has You Covered. Why Spread? The Best Part Of A Pedicure Is The Foot Massage. Those Precious Moments Of Pampering And Soaking In Warm Water Is Our Sweet Reward For Carrying Us Around All Day. At Some Point, We've All Experienced Foot Pain. Whether From Long Days In Closed-Toe Shoes Or A Night Out Dancing In Heels, Our Feet Yell At Us With Our Discomfort. Each Foot Is Designed With 26 Bones, 33 Joints, More Than A Hundred Muscles, Tendons, And Ligaments That's A Lot Happening In Such Compact Space! Let's Help These Poor Soles Out. While Many Foot Ailments Can Be Genetic, Many Are Caused From A Lack Of Attention To Our Design. Spreading Your Five Toes Is One Of The Best Ways To Help Your Feet. Relieve Discomfort And Pain From Bunions Caused From Wearing Constraining Footwear. Help Reverse The Damage Caused By Wearing Tight, Ill-Fitting Shoes That Can Cause Painful Foot Ailments Like Morton's Neuroma. Activate Muscles And Increase Blood Circulation For Enhanced Healing. lign The Bones And Strengthen Muscles To Train The Toes To Naturally Uncross. TOESOX: Beckon your inner ballerina with styles that's on pointe with the ToeSox Elle. Elle's elastic criss cross design keeps sock snug on foot through all activities & non slip sole makes this the perfect grip sock for yoga, Pilates & barre..
DESIGN: The toeless Elle grip socks has a low profile design that fits right below the ankle, making an ideal sock for barefoot exercise activities including barre, piyo, kickboxing, and dance. The arch band provides pressure to lift and support.. GRIP: Achieve perfect poses in comfort with the Elle grip sock. The patented non-slip grip sole provides secure foot placement while the five toe design encourages toes to spread and breathe more easily. This helps keep your feet free from restraint..
MATERIAL: The Elle toes socks makes for a great alternative to keep your feet clean, healthy, and hygienic. Made with 74% Cotton, 19% Polyester, 3% Nylon, and 4% Other Fiber, the Elle keeps your feet comfortable throughout any exercise..
ToeSox are made with a five-toe design to promote toe separation resulting in greater flexibility and strength. The Patented Non-Slip Sole provides slip free security during your practice. Worry no more about dirty mats and sweaty residue, ToeSox are the best hygienic alternative to bare feet. Made with cool and comfortable organic cotton. The new 1/2 Toe design increases tactile sensitivity & awareness. Cooler style for warmer weather and great for Hot Yoga.